Well the year is truly winding down. This is the time of year for planning and introspection. I am sitting here surrounded by seed catalogs, spreadsheets and notes from the last season trying to make myself order seeds. Maybe its the short days and the low angle of the sun but it is difficult to get the brain headed in that direction. Instead Betsy and I have been having long talks about the future and what it might look like, both for us and Peregrine Farm. Now this is a common practice for us this time of year but after the tumultuous season that gave us many twists and turns we seem to be looking at life a little harder. We think that most folks see Peregrine Farm as a constant with few changes but in reality we are changing all the time, both the farm and us. For Betsy this has been the year of all things Italian with a keen interest in their culture and artisanal food. She even suggested, that maybe for a change, that she take over the vegetable production and I run the flowers. I raised an eyebrow at that one. For me the big change that has knocked me out of my comfortable patterns is taking over the poultry processing plant. Very scary at times but intellectually stimulating too, we still think that it is such a important piece of the local food system that it must happen. The wish list of changes is forming; new crops (lots of artichokes, baby swiss chard, pigs? ), new places to see (Italy again, Kenya for Betsy, southern Utah for Alex), new techniques to try which I will not bore you with now. The biggest immediate change though will be the passing of my father Sam. Many of you knew him as a fixture at our stand at Market. Others may know him from his years at the University of North Carolina. For Betsy and me he was a constant supporter and sideline advisor of our work for 25 years, and of course for my entire life. Many people ask how I got into farming and I usually reply that my father was a rabid gardener and my mother a fabulous cook. We grew up working in his gardens and eating three home cooked meals a day from her kitchen. He lived a colorful, varied and determined 84 years. He was first exposed to gardening as he grew up in rural Arkansas and spent summers with his grandparents. Early morning trips with his grandfather to pick breakfast berries, gorging himself on figs while sitting under the bush and more. He was the first in his family to go to college. He lived in Memphis where he met Mom. Spent time in the Pacific, in the Navy, in World War II. A life long movie nut he went to cinematography school at the Univ. of Southern California before deciding to settle down and become a librarian. They moved to Atlanta where he graduated from Emory Univ. and my brothers were born. His first grand garden was in Columbia, Mo. where my sister and I were born. He began to develop a style that included wide choices in plants in large beds with fences, patios, and garden art. As kids we lived outside during the warm months and we all had small personal gardens with radishes and more. He took us to Connecticut where he started the Univ. of Conn. Medical School Library. Gardening continued to consume him and with the help of the “homegrown” work force he transformed a difficult hillside into a terraced wonder. 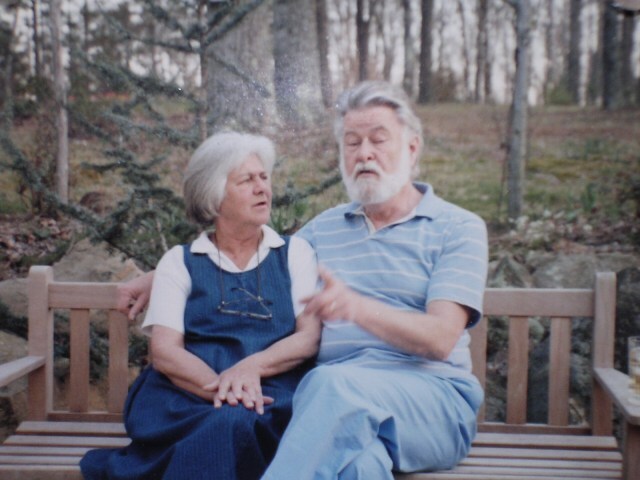 During our stay in Connecticut he made a business trip to Chapel Hill and returned telling Mom that he found the place for them to retire and garden. A detour to Houston, Texas and the medical center library was the nadir of his gardening life. Miserable climate and soil on a quarter acre suburban lot. One Christmas we had railroad ties and top soil brought in and we built him a garden. 8 feet by 16 feet and two feet high he would come home from work, make a drink and go out and work in the garden, it helped keep him sane. Finally he became director of the UNC Medical Library and his garden dreams unfolded. The house that they remodeled and he designed and the gardens became the culmination of a lifetime of moving, travel and collection. Over three acres of rolling terrain, granite boulders and mature hardwoods eventually would comprise the gardens. Early on Betsy and I helped build the bones of the place with rock walls, raised beds, brick patios, pergolas and more. Betsy spent many days with him going to nurseries and others gardens feeding their plant lust. For those of you fortunate enough to visit the place and eat Mom’s food understand how they could influence ones life. The picture below, while not crisp, is typical. Pop sitting in the garden holding court with friends while Mom looked at him, trying to figure out where he was headed. We will all miss them both, and we thank all of you we have talked to since his death. I will leave you with two book suggestions for Christmas gifts or just winter reading. The first is a couple of years old “Local Flavors- Cooking and Eating From America’s Farmers’ Markets” by Deborah Madison is one of the best reads on the importance of farmers’ markets and local food with many great recipes. The second is brand new “Fields of Plenty- a farmer’s journey in search of real food and the people who grow it” by Michael Ableman. An excellent read about many sustainable, artisanal food producers around the country. It also includes many recipes by the farmers themselves. Betsy and I know many of these growers. Between the two I think one can begin to get an accurate picture of a small farmers life and what inspires them. Betsy and I hope you all have enjoyable holidays, eat well, rest up and stay warm.